I have sold a property at 410 1133 HOMER ST in Vancouver. This is a great one bedroom and den, corner unit at H+H in the heart of Yaletown. Close to world class shopping, restaurants and fun. Open and bright with floor to ceiling windows overlooking an urban streetscape and your own private covered balcony. Chef's kitchen with Viking professional range, granite countertops, tile and laminate flooring. Five piece bathroom with double sinks. Work from home in the office and walk to everything Downtown, The Seawall, and Skytrain. YOU'LL LOVE IT! Please visit our Open House at 3530 33RD AVE W in Vancouver. Substantial Dunbar family home. A big 50x130 RS-5 lot with beautiful South facing backyard. Completely renovated with addition in 1978, this 6 bedroom, 3 bathroom home has lots of space for rental income while you prepare plans for your new house or renovation to update. Close to shopping, parks, the community center, St George's and Crofton Private Schools. Easy Access to UBC, Pacific Spirit Park, YVR airport and Transportation. YOU'LL LOVE IT! I have listed a new property at 410 1133 HOMER ST in Vancouver. This is a great one bedroom and den, corner unit at H+H in the heart of Yaletown. Close to world class shopping, restaurants and fun. Open and bright with floor to ceiling windows overlooking an urban streetscape and your own private covered balcony. Chef's kitchen with Five burner Viking range, granite countertops, tile and laminate flooring. Five piece bathroom with double sinks. Work from home in the office and walk to everything Downtown, The Seawall, and Skytrain. YOU'LL LOVE IT! Please visit our Open House at 410 1133 HOMER ST in Vancouver. VANCOUVER, BC – December 4, 2017 – Metro Vancouver* saw modest home listing changes and steady demand in November. 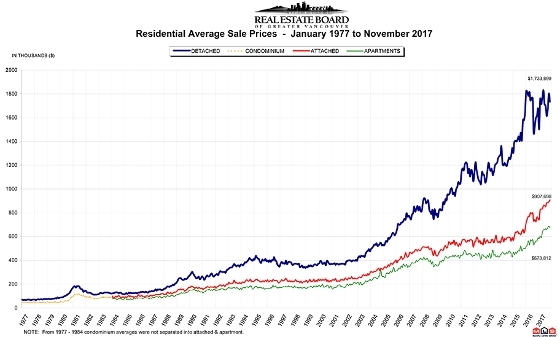 The Real Estate Board of Greater Vancouver (REBGV) reports that residential home sales in the region totalled 2,795 in November 2017, a 26.2 percent increase from the 2,214 sales recorded in November 2016, and a 7.5 percent decrease compared to October 2017 when 3,022 homes sold. Last month’s sales were 17 percent above the 10-year November sales average. There were 4,109 detached, attached and apartment properties newly listed for sale on the Multiple Listing Service® (MLS®) in Metro Vancouver in November 2017. This represents a 30.6 percent increase compared to the 3,147 homes listed in November 2016 and a 9.5 percent decrease compared to October 2017 when 4,539 homes were listed. The total number of homes currently listed for sale on the MLS® system in Metro Vancouver is 8,747, a 4.3 percent increase compared to November 2016 (8,385) and a 4.3 percent decrease compared to October 2017 (9,137). The sales-to-active listings ratio for November 2017 is 32 percent, which is up three percent since September 2017. By property type, the ratio is 15.9 percent for detached homes (up one percent since September 2017), 36.4 percent for townhomes (down six percent since September 2017), and 67.8 percent for condominiums (up seven percent since September 2017). Generally, analysts say that downward pressure on home prices occurs when the ratio dips below the 12 percent mark for a sustained period, while home prices often experience upward pressure when it surpasses 20 pecent over several months. The MLS® Home Price Index composite benchmark price for all residential properties in Metro Vancouver is currently $1,046,900. This represents a 14 percent increase over November 2016 and a 0.4 percent increase compared to October 2017. Sales of detached properties in November 2017 reached 841, a 31.8 percent increase from the 638 detached sales recorded in November 2016. The benchmark price for detached properties is $1,608,000. This represents a 6.1 percent increase from November 2016 and a 0.1 percent decrease compared to October 2017. Sales of apartment properties reached 1,508 in November 2017, a 25.7 percent increase compared to the 1,200 sales in November 2016. The benchmark price of an apartment property is $648,200. This represents a 23.9 percent increase from November 2016 and a one percent increase compared to October 2017. Attached property sales in November 2017 totalled 446, an 18.6 percent increase compared to the 376 sales in November 2016. The benchmark price of an attached unit is $805,200. This represents a 17.9 percent increase from November 2016 and a 0.3 percent increase compared to October 2017.